Ok so I know I've been absent from the blog world for a while but this winter would just never end! Gmf suggested leeks but I don't think they were in the right spot for that. 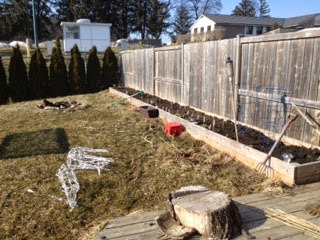 I also added some rock dust, fertilizer and blood meal to the garden to help replenish the nutrients all the veg ate last summer and keep the animals out. 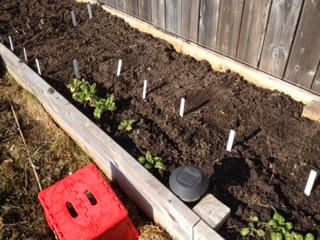 The spinach that was left to over winter is doing ok but there's not much of it. (Maybe enough to add to a tiny salad). Should have got a better close up of that. 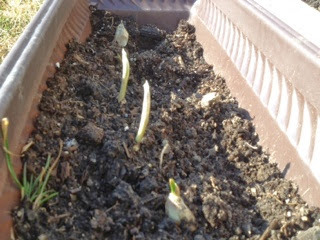 I can also see the garlics popping up. 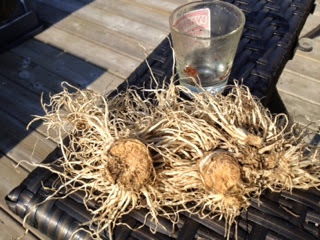 I hope they work but I am afraid I might have white rot in my soil (my garlic didn't work last year, and I discovered a clove with a bit of fuzzies on it). Argh. Should I split these up? I don't have a lot of experience in these areas so any suggestions would be great. Today I rushed home from work and went right outside (it was a whopping 10 degrees. Whohoo!). I planted all the cold weather hearty things I could find. Can't wait to have my first harvest. 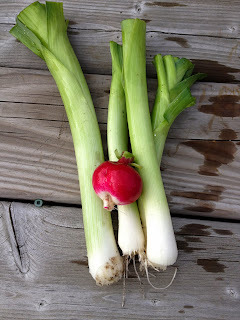 I'm trying three different kinds of radish in hopes to find a more milder version for snacking. And here's a picture of my snow graveyard of a backyard. Rain deer must be hybernating for the summer. Better get them into the cooler basement soon. I do not call these new years resolutions, because that terms just seems jinxed. These are goals for myself that I hope to accomplish this year. Last year GMF and I said no fast food burger joints in 2013 and I only cheated once on halloween (I was dressed up like the Hamburglar, I needed to eat a McDonald's burger). This year I am challenging myself with a couple more goals and I'm hoping that by documenting them on the internet for all to see it will give me more motivation to succeed. Most of these goals are to work towards a healthier lifestyle. 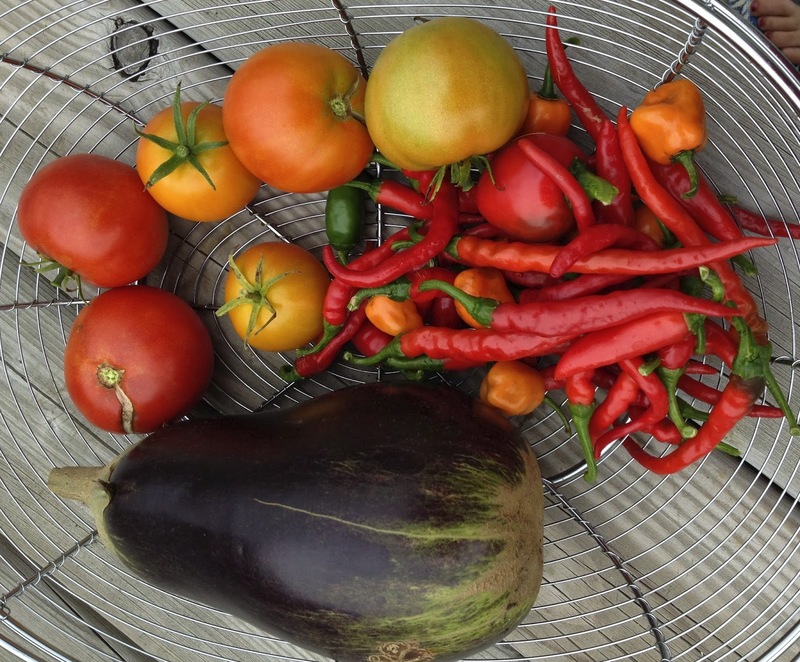 When I'm home in the summer I do really well because I have my garden but I need to focus on the rest of the year. First taking an idea from Modern Family: Jay set a goal of using his elliptical machine for a distance that equated to reaching the Canada boarder by the next Christmas. I am setting a goal of biking a distance which is equivalent to going around lake ontario from my house and back. This is a distance of 1128 km. I wish to reach this goal by the end of 2014. Biking to work is 4.5 km's so if I do this more often this should be an accomplishable goal. Second is limiting my pop intake to 2 a month. I have always drank way too much pop and in the past I have tried giving it up during the week with some success. I'm hoping this will lead to healthier beverage choices (drink more water!). Third: bring more lunches to work. I am often sneaking out to Tim Hortons and grabbing a bagel for lunch or something. I need to be more organized with my meal planning so that I always have something that I can bring for lunches. Fourth: set a realistic cleaning schedule and stick with it. I have never been able to keep a clean room let alone a clean house. In 2014 I would love to improve on this. I think the key here is to be realistic, I'm not going to become Ms. Holly Homemaker just stop being Ms. Molly Messmaker. Fifth: stay in touch more with family and friends. You see I hate talking on the phone (I actually get kinda anxious about it - don't ask why I have no idea, it just feels so awkward). I need to make a better effort to Skype with my parents, brothers, nieces and nephews. The kids grow up so fast, and I don't get to see them in person as much as I would like. I will Skype with both my brothers and their family at least once a month and my parents once a week. And call my grandmother at least once a month. So those are my goals for 2014. What are your goals? Let me know in the comments or post a link to your New Years post. This year I wanted to share some homemade gifts with people for christmas. I think homemade gifts are so much more personal. I also love edible gifts, because lets face it most of us have enough things and many gifts sit in a closet somewhere never to be worn or used. The idea came from the plethora of hot peppers I grew this year. I planted so many hot peppers knowing I wanted to make hot sauce, but I didn't realize just how much hot sauce I'd be able to make with that many peppers. After making the first batch and seeing how far a handful of peppers went I knew I would have more than I could ever need. So I decided that I would give nice hot sauce bottles away for presents. This hot sauce is a sweet habenero hot sauce. It's not too spicy so its great for coating chicken strips or wings in (yum!). I also dried many of the cayenne peppers and made my own chill powder and crushed chili flakes. The crushed chili flakes are in the jar near my finger in the picture (doh!) inside the jar is also a tiny ziplock with the chili powder. I have been using the chili powder like crazy, adding extra heat to almost everything I make; pasta, chili, chicken, soup, etc. GMF and I also started brewing our own beer in 2013 so we wanted to share this others. In the gift package was one of each of our batches - A cream ale (our first beer, and my go to), a raspberry wheat, a apricot wheat, and an extra special bitter (ESB). I created labels for the beers with just my printer and some avery labels (won't hold up to a cooler full of ice, but does the trick in a pinch). I also covered the 6 pack box in decoupaged craft paper and a printed label. I've named our brewery compass Brewing company for now but we are still looking for a permanent name. What do you think of compass Brewing co? Did you give away any homemade gifts this season? I'd love to hear about them, tell me about them in the comments or write a link to your blog. I hope everyone is having a great holiday with their family and friends. It's that time again, Harvest Monday. This series is hosted by Daphne and is a great place to see what people are harvesting all over the world. So head on over to Daphne's Dandelions and take a peak. Here is what I harvested this week. I made a gift basket of veg and herbs for a friend that often gives me rides to our Ultimate games. I play Ultimate (frisbee) regularly, if you've never heard of this sport you should check it out is a great combination of football, basketball and soccer strategies. It is excellent exercise and fun for all skill levels. Back to the harvest: I harvested some lettuce regularly for salads, herbs such as basil, parsley and oregano was given away to friends. I'm still picking cucumbers which is awesome!! There are still several egg plants also (I gave this one away to another Ultimate friend and he made eggplant parmesan with it and said his kids loved it!). There are still lots of leeks in the garden as well varying in size, this one was a big one. And hot peppers, oh my I feel like I'm over run with hot peppers. I have been giving these away to work and ultimate friends. 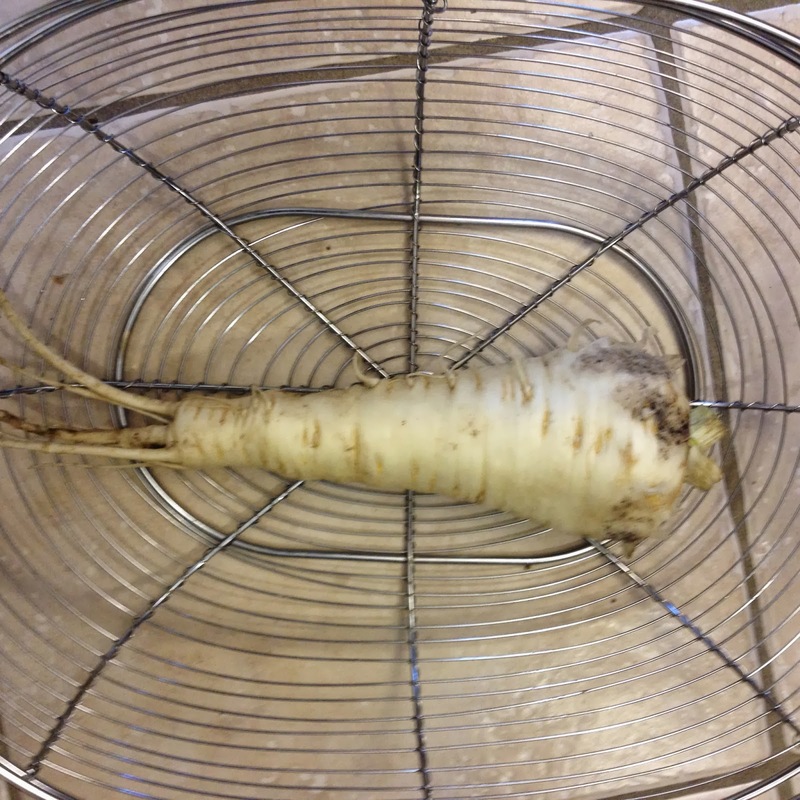 This was probably the most exciting harvest of the week, my first parsnip ever! I was making Chicken pot pie and needed a parsnip - check my post about that recipe. So out we went to harvest one. We were going to leave them all till after the frost but when a recipe calls for parsnip you pick parsnips! I went to pull on the green tops like I do to pull up carrots, but the tops just popped off the root. So I dug to the root and was shocked to see how big it was. It was over 2.5 inches in diameter. 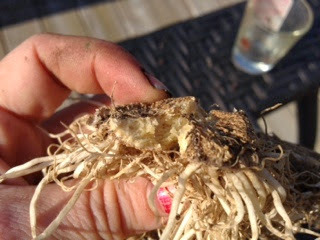 I tried to pull from the top of the root but it wouldn't come up that way either. We needed to dig all around to get this massive parsnip out of the ground. We did damage it a little trying to remove it but there was more than enough goodness left for what I needed. Here are two of the smaller leaks that also when into the chicken pot pie. The grape tomato plant is the only one left as I removed my other two (health kick and ultra sweet) last week. This one still has several tomatoes but they need to be picked a little early or they are splitting on the vines. And more hot peppers!! Cherry bomb, habanero, and cayenne. 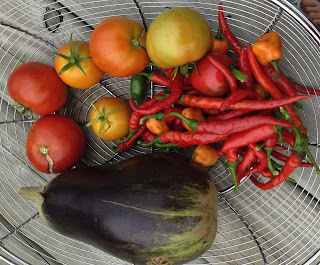 I am not surprised by the number of cayennes or even the habaneros as they have been on the plant green for a while and just needed to turn colour. But the cherry bombs came out of the no where, we thought this plant was almost done about a month ago, but then all of a sudden it started producing many new fruit very quickly, more than it was making mid summer. I've got to get on clearing some space in my garden for my garlic to over winter. What are you still harvesting? Are you planting anything to overwinter? Let me know in the comments. 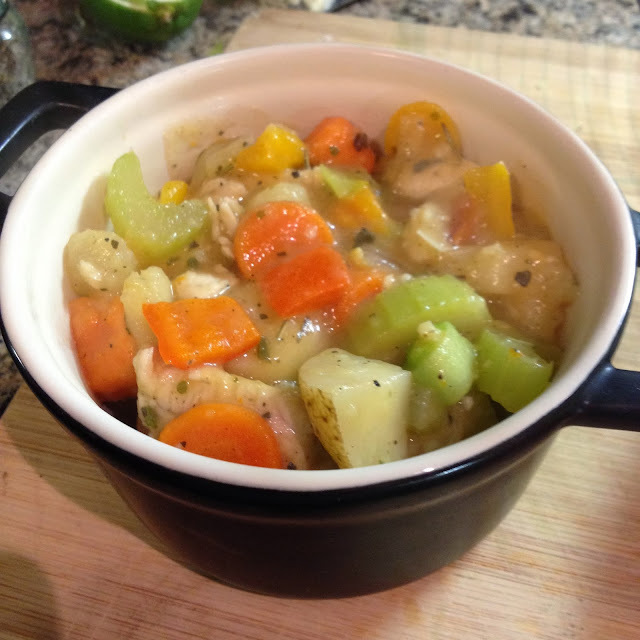 I love dishes like chicken pot pie, because they are so comforting. They use up whatever veg you have in the garden, or fridge. The recipes are easily changed and manipulated to suit your own tastes and it is easily froze for future consumption on a cold fall evening. As you can see in the picture my twist on this classic recipe is in the crust, instead of one of the two usual suspects (dough crust or dumplings) I use stove top stuffing. Trust me this is delicious and sooo easy. I don't need to mix batter to make this crust, I can just use left over stuffing from a chicken or turkey I have made or just whip up a box from the store. If you make it from homemade stuffing it is that much better, plus you probably have left over chicken or turkey to use as well. But I digress, and I had no left overs to use so on with the recipe. First I gathered together all the veg that I wanted to use. This included: Sweet potato, potatoes, turnip, carrots, parsnip, bell peppers, onion, and celery. I chopped up all the root veg first as it takes longer to cook. I put all this veg is a pot with some water and par-boiled it to give it a head start. While that was cooking I sliced up the celery, bell peppers and onions and sautéed them. 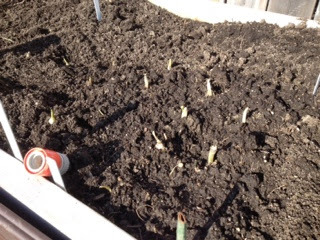 Then GMF came in a said what about leeks, great idea, so he ran out to the garden and picked a couple small leeks to add. I also added about 3 cloves of crushed garlic to the sautéing veg. Note in the future I would do more leeks, celery and onions. The ratio of root veg to others was a little to high this time. Then I put everything together in a large pot and sprinkled with a couple tablespoons of flour and mixed in. For the stock I used chicken stalk - about 2 cups by eye (just enough to almost cover the veg) and a couple shots of vermouth (this gives it a great flavour) it will reduce and thicken with the flour. The main seasonings I used were salt, pepper and lots of sage. Oh and just as I did when I was cooking I almost forgot the chicken. I sliced up a couple chicken breasts and sautéed them with some oil and sage and added this to the mixture of vegetables. When the mixture was all combined and the sauce thickened I added it to individual sized ramekins, but you can make this in one large casserole pot and serve family style as well. 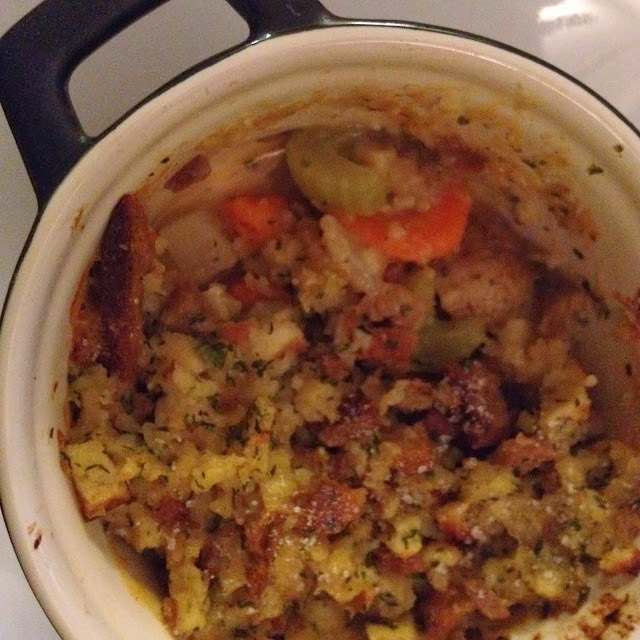 Then I added the stove stop stuffing to the top and cooked in the oven on broil to crispen the stuffing. As you can see when it is cooked some of the juices will boil over the top. Be careful when cracking into this it will be very warm on the inside, but soooo delicious. Here's a not so great photo of what it looks like when someone has started munching. I also had plenty to make three freezable individual dishes. I used the tin pie plates for this because we had them on hand. I put them in a ziplock bag in the freezer as well. 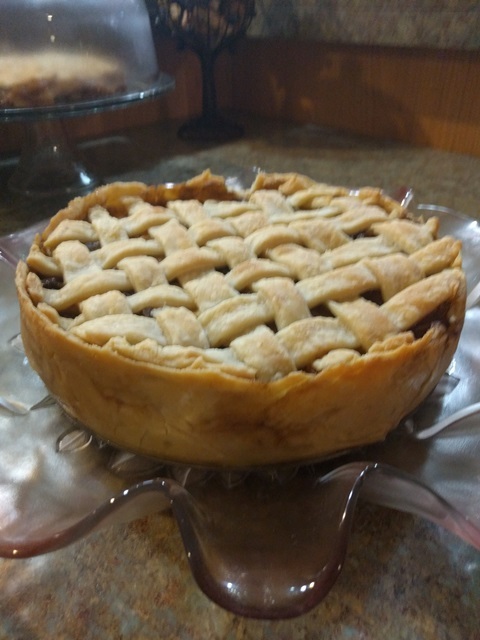 I need to get some pyrex individual pie plates for this in the future. Ok so if you know me, you know I'm kinda a picky eater. I've gotten much better over the years but there's still a lot I don't eat. Most of my pickiness is due to textures. I'm not a big fan of any skin on a fruit or veg, I almost always prefer the skin off (except for potatoes - I love the skins on potatoes, but even that I didn't like growing up). Tomatoes I can eat with the skins but I prefer not. 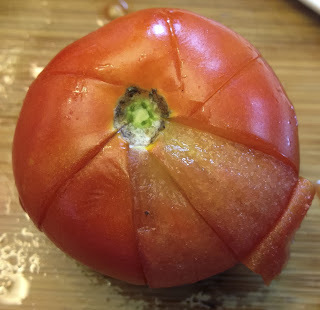 So I was making salsa the other day and I decided I would peel my tomatoes to give a more uniform texture. I don't boil my tomatoes, thats too much work for me (because I'm impatient and a little lazy). I peel them much like some peel oranges or nectarines. I score the edges in slices. 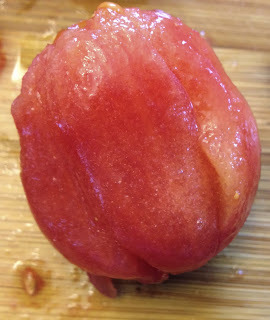 Then peel off the skin from each slice, they come off in sections very easily. What else is great about this way to peel a tomato is that is also makes it easy to deseed and separate all the flesh. If you've scored it deep enough it has created slices into the juicy part. 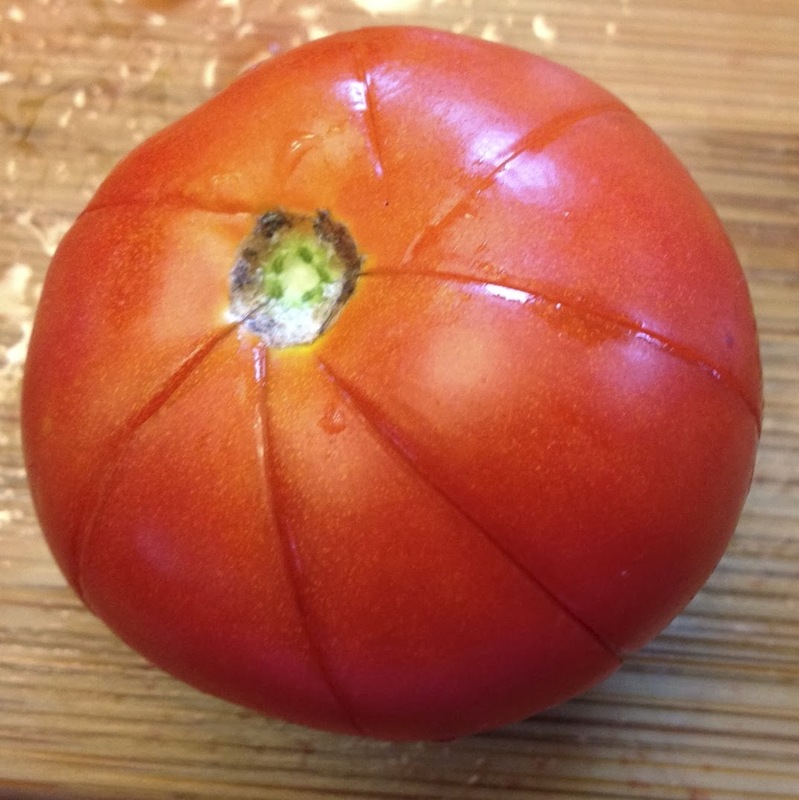 Simply hold the tomato over a bowl and slowly squeeze. (unfortunately I didn't take pics of this but I will next time and I'll amend this post). 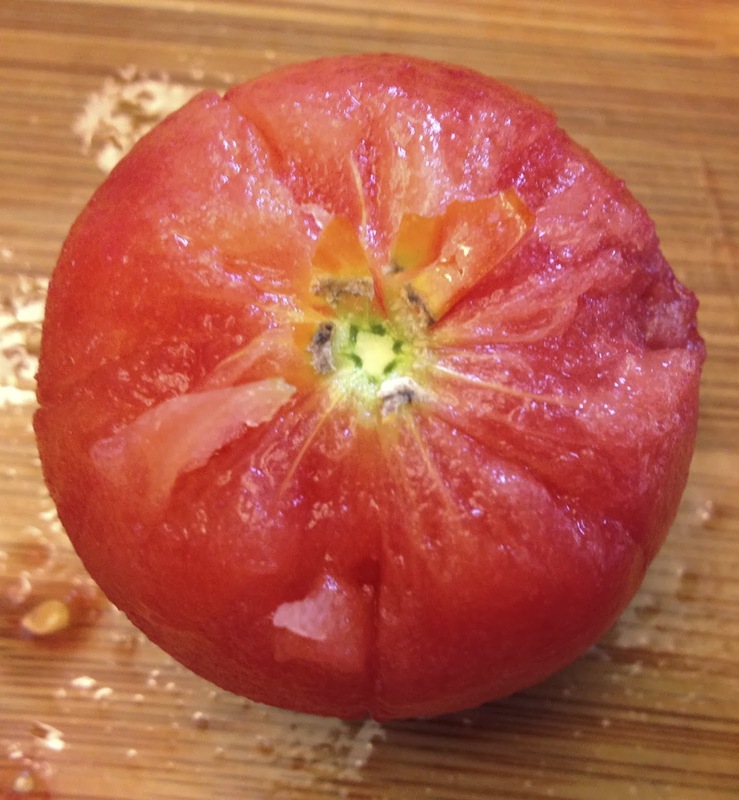 The juice and the seeds will squeak through the cuts in the tomato. Then you can slice the tomato as you usually would and it will just be the flesh. 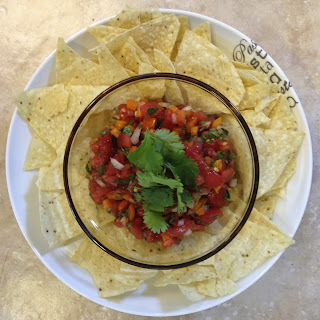 Yummy Pico de Gallo style salsa that I made with some of the new thiner Tostitos. I am linking up this post with Tuesday Garden Party over at An Oregon Cottage, go and check out what other people are doing with their garden goodies! I can't believe it's October already, probably because the weather here has been summer hot for the last week or so, 25-35 degrees most days. 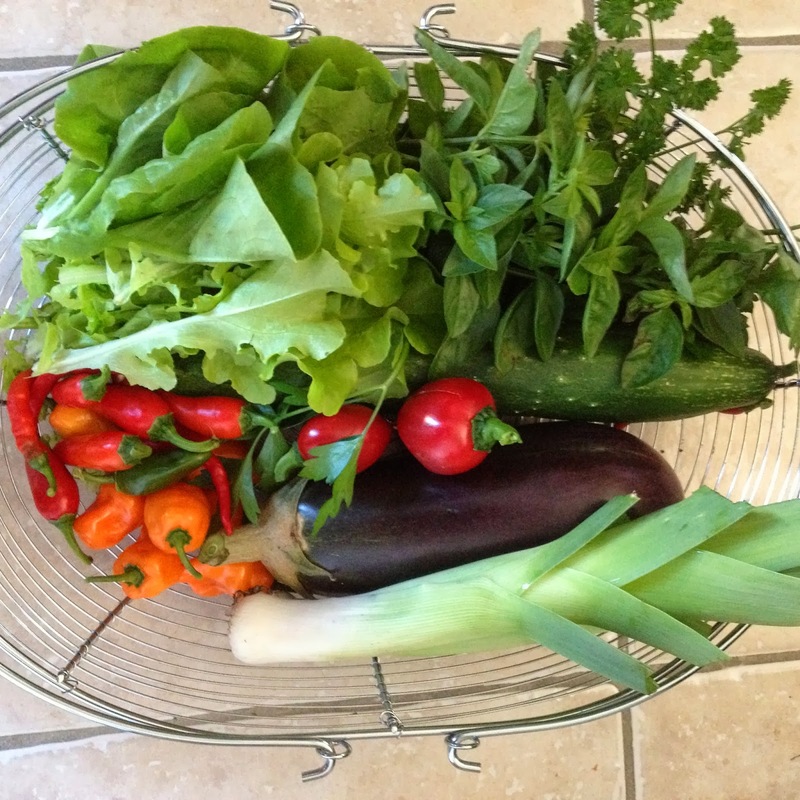 It's that time again where we get to show off our harvests from the previous week and look at what others are harvesting around the world over at Daphne's Dandelions. The harvests are definitely slowing, but I still got a good haul this week. 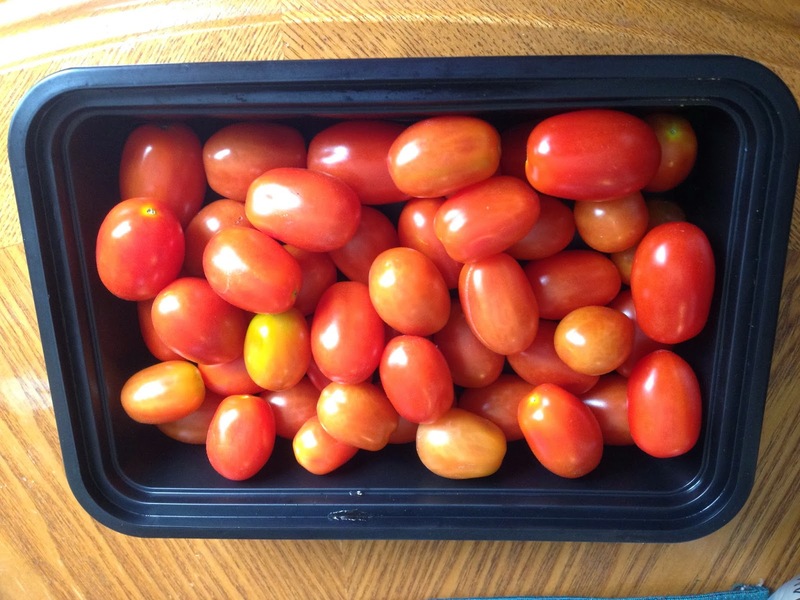 I picked the last of the tomatoes as they were starting to split like crazy on the vines, so they will ripen inside. 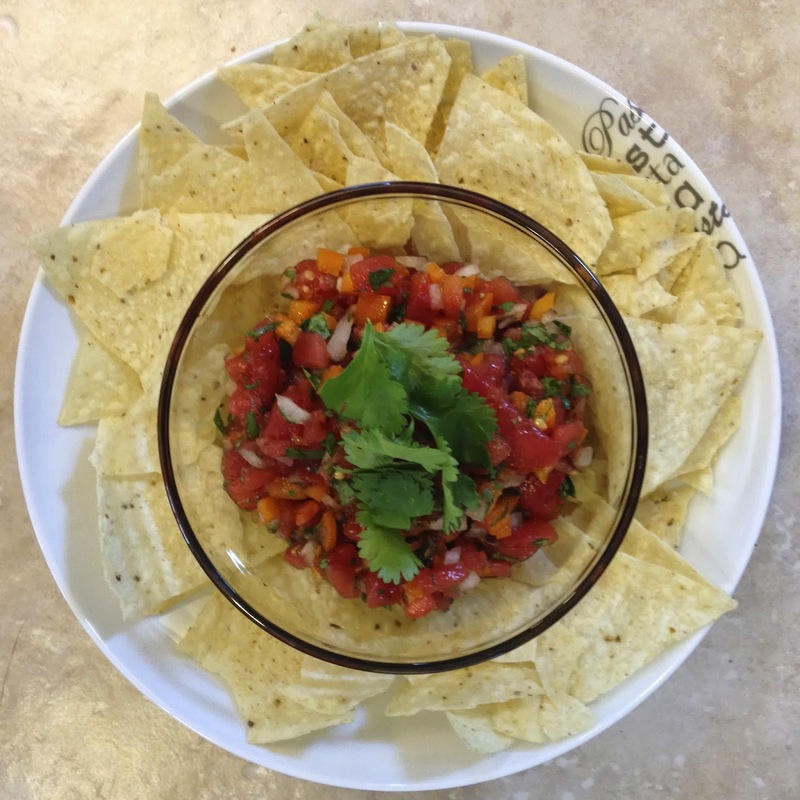 I've been making lots of fresh salsa (I love homemade salsa!). I've continued to pick hot peppers, and theres no end in site for these. I've got tons in the freezer and I'll dry some more. 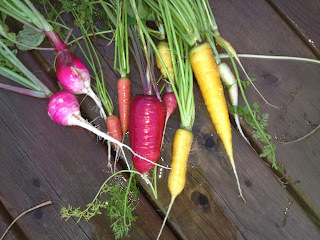 I also picked the last of the rainbow carrots. One of them was a big fatty and delicious as a snack. 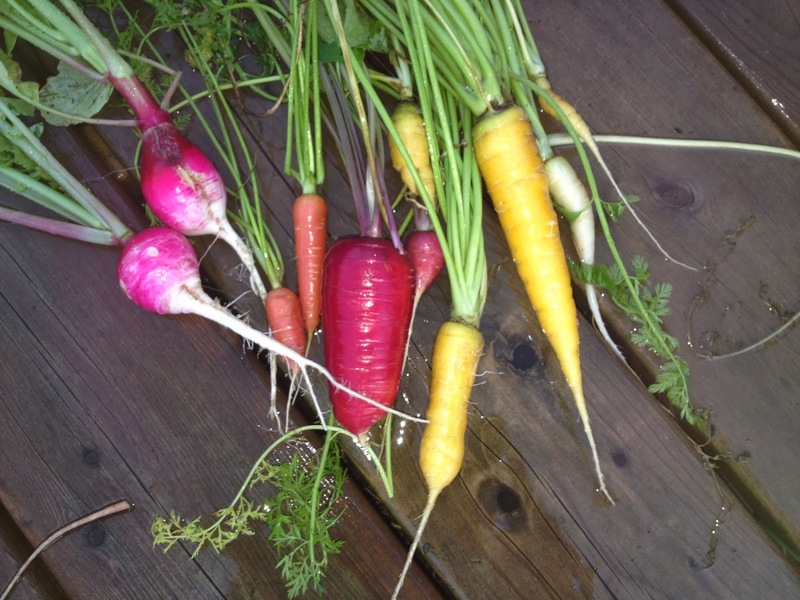 Also the fall radishes, only three out of the 6 created good fruit. They were tasty I think I'll try this variety again in the fall, now to find right packet of seeds to identify which variety they were. I'm also still harvesting leeks. This week for my Grow it! Cook it! Eat it! Live it! series I posted a leek and potato soup recipe with crispy potato skin and bacon bit topping. 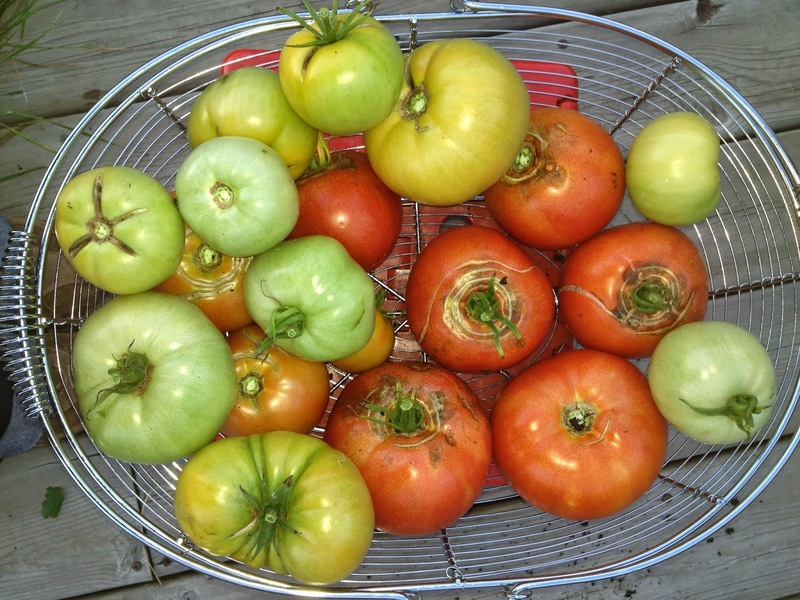 I've pulled out two of the three tomato plants, the grape one is still going and ripen fruit on its own. so I'll leave that till the first frost warning. I am wanting to make room for my fall planting of garlic. 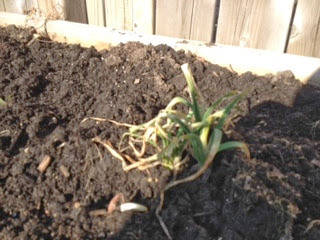 How close to frost do I plant the garlic, this will be my first time and any tips would be greatly appreciated. I recently I bought my first house after living in an apartment for years. The best part about owning a house for me is having a yard to spend the days in. Many of my fondest memories are from gatherings in a backyard. It's Official - see you on 7 April!